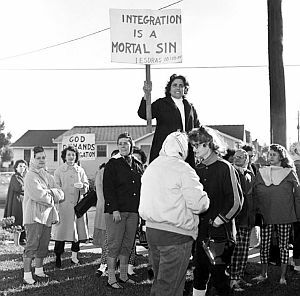 What does 1 Esdras have to do with racial integration? Steinbeck drove to New Orleans specifically to see the daily circus of hate and what he saw rightly disgusted him. He felt that the “sad sickness” of that racist sideshow could not be conveyed unless the foul things the working-class women screamed were put down on paper for all to see. Writing that he knew there was “not a chance in the world that my readers will see” the women’s “bestial and degenerate” words, he quoted—or, more likely, he wrote down a condensed version of how he remembered them…. Next Why you cant have Church in a PUB.